If you ask the average or casual whiskey drinker about rye whiskey, they will likely never have tried it outside of a cocktail, or say they are not a fan, without ever really having tried it for themselves. While bourbon has dominated the American whiskey market for years, rye whiskey has made a huge comeback over the past few years, and there does not seem to be any end in sight. Dating back to the days of prohibition, it was rye that was the original grain of choice by American whiskey makers, not corn. It wasn’t until after prohibition ended that corn took over and became the grain of choice, making bourbon whiskey America’s choice spirit. This was in large part due to corn being far less expensive, and in the end far easier to work with. By the 1990’s, rye whiskey had an afterthought and was being ignored by most whiskey drinkers. It wasn’t until the early 2000’s that craft whiskey started to enter the market, and the cocktail craze started to emerge that rye was “rediscovered”, and the demand for rye started to once again grow. That’s about the time many of the bigger distillers took notice, including Jim Beam. Knob Creek Rye is a product of Jim Beam and is an extension of their Knob Creek line. While the standard Knob Creek Rye has been on available since 2011, their single barrel rye’s are new to the market and is providing consumers with a true drinkable, yet affordable high proof premium rye product. 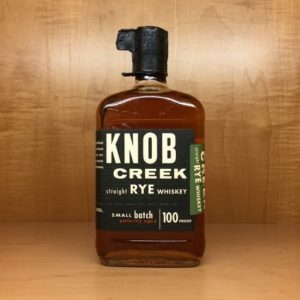 Knob Creek was one of the first “premium bourbons” products Jim Beam brought to the mass market back in the 1990′s, along with other now staples like Basil Hayden, Booker’s, and Bakers. All of those offerings were bourbons though, so as the demand for rye continued to grow, Knob Creek Rye was born. Now some 7 years later the demand for higher proof rye’s has increased, and thus Knob Creek single barrels rye’s have (finally) come to be. Payless was fortunate enough to get in early to this new offering and was given the opportunity to select from several premium offering of this high-proof rye. A select panel of bourbon tasting experts unanimously selected the same rye barrel, identifying it as a clear cut above the rest, and now this special hand selected single barrel rye whiskey is available exclusively for Payless customers. Sweetwood jumps out of the dram, followed quickly by those traditional rye spice notes of cinnamon, nutmeg, & even some clove that one comes to expect in a rye whiskey. There is dried orange peel, and a pleasant vanilla mid-note that slowly opens up to allow in some dried black cherry, and notes of black pepper. There is complexity here that starts your taste buds to get very excited to take the next step. A silky texture presents with sweet caramel and wood leading the way. Swiftly entering are strong notes of sweet candied apricot and orange. There is a strong vanilla mid-pallet, with a balancing under-note of some subtle almond mixed in. Oakwood notes mix with soft hints of leather enter as the heat from the proof announces itself. There’s a nice spice that is present throughout to provide that kick you look for in a rye whiskey, but never fully extinguishes an ever-persistent sweetness that presents itself from start all the way through the finish. Joining the party late are some subtle notes of ginger and black pepper that present themselves at the very end. A long, spice filled finish provides complexity and a firm backbone, yet is still sweet and extremely drinkable. While there is a punch of heat, that is to be expected from a near cask strength product (single barrels are 115 proof, while recent cask strength releases were just 119 proof), but don’t let that scare you. This hand-selected barrel provides an array of mouth-watering flavors that lay on the tongue from front to back and sparkles with enjoyable bursts of spice, vanilla, caramel, and ripe fruits. This is a drink that can be enjoyed neat, or will rock out any cocktail of your choice. This is a rye not to be passed on if you are lucky enough to find one.